Raul Julia and John Duigan. Four Seasons Entmt. (c) 1989. The first Hollywood feature film ever to be financed by the Roman Catholic Church was released twenty-five years ago on August 25, 1989. 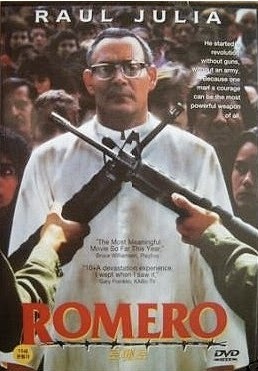 “Romero” starred the Puerto Rican Raul Julia (“Kiss of the Spiderwoman” and the “The Addams Family” franchise) as Salvadoran Archbishop Óscar A. Romero, and was directed by the Australian John Duigan. The writer was John Sacret Heart (TV’s “The West Wing”), and the producer was Paulist Pictures’ Fr. Ellwood E. Kiesel. 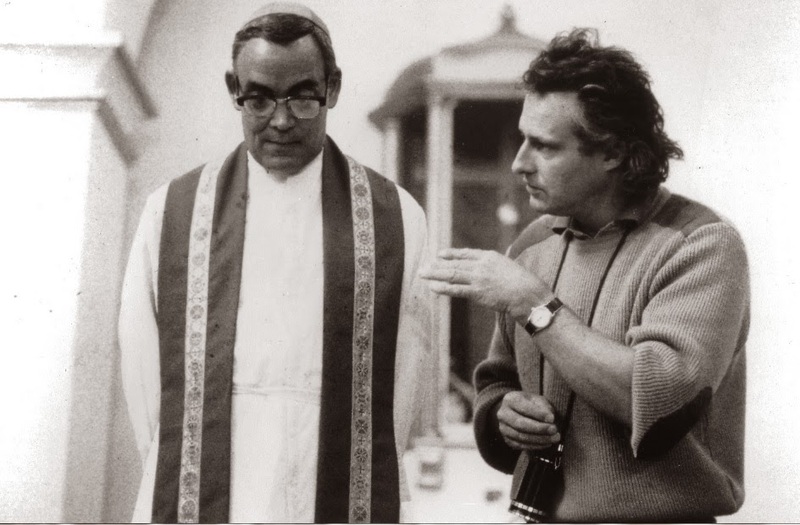 “[I]ts religious origins notwithstanding,” the New York Times wrote, the film was “a frankly commercial venture aimed at a mass audience.” But unlike what happens in other movie sets, the cast and crew of “Romero” would gather each week to celebrate Mass, with the producer (Fr. Kiesel) as its celebrant. Released before ten years had elapsed from Romero’s 1980 assassination, the film became essentially the first draft of the Romero legend, presenting what has become the dominant paradigm used in telling Romero’s story—complete with its motif of a bookish conservative who becomes a firebrand after experiencing a late life about-face, due to the murder of a close friend. The movie has been instrumental in making Romero familiar to audiences, especially in the English-speaking world. To be sure, Romero’s assassination made international headlines when it occurred at the end of the Cold War, but the movie presents an intimate portrait that resonates much more than a flashing headline, bringing viewers face to face with Raul Julia’s well-crafted and elegant portrayal of the modern martyr. The movie predated the institution of Archbishop Romero’s canonization cause in 1994, and the unveiling of Romero’s statue on the West façade of Westminster Abbey in London in 1998. Twenty five years on, “Romero” has taken its rightful place in the Catholic marquee. In 2004, the National Catholic Register and Faith & Family magazine ranked “Romero” no. 26 in their “Top100 Pro-Catholic Movies”, and when the U.S. Catholic Bishops “Fortnight for Freedom” was launched in 2012, the Register recommended watching “Romero” during the F4F. “Romero” is routinely listed in top Catholic film lists, including one released earlier this year. The late Roger Ebert gave “Romero” modest praise, writing that “[t]he film has a good heart, and the Julia performance is an interesting one, restrained and considered.” However, Ebert qualified, “[t]he film's weakness is a certain implacable predictability: We can feel at every moment what must happen next, and the over-all trajectory of the film seems ordained even in the first few shots. As a result, the film doesn't stir many passions, and it seems more sorrowing than angry.” Although Ebert makes a valid criticism (which is why he is cited here), his final point seems to miss the mark. The real Romero was not angry, and in this way the movie paints an authentic portrait of its subject. One thing “Romero” did not set out to be, and should never be mistaken to be, is history. It is very accurate as a character sketch, as a psychological examination, and as an emotional x-ray of the story it tells. But most of the characters onscreen have been renamed, probably to avoid defamation claims from the actual people, who were still living when the film was made. Many other characters are entirely fictionalized or, at best, represent composites of several historical figures, edited to simplify the story or move it along. There is nothing dishonest in this: the practice is the same in other films, like “For Greater Glory”/“Cristiada” (2012). Along the same lines, there are sequences and events that never happened (e.g., Romero being thrown in jail), but the dramatizations are allegorical and ring true, while other important events that did occur were left out (e.g., Romero’s meetings with the popes). The most consequential editorial decision was arguably the determination to portray Romero as road-to-Damascus styled conversion. When the film opens, Romero is a retiring, reserved, and reviled cleric (“Anyone but Romero!” we hear young priests gripe amongst themselves, in his presence). He is shown to be chummy with the aristocrats. By the end of the film, Romero is an impassioned and fearless defender of human rights, beloved by the common poor, and now reviled by the oligarchs who were his friends at the beginning. The film itself is balanced in its treatment, but by setting Romero up in such stark contrasts, it invites abuse of the “conversion” model of Romero’s life. Take for instance, this description of the pre-conversion Romero: “he sided with the greedy landlords, important power brokers, and violent death squads.” That’s a grotesque mischaracterization—especially the part that Romero “sided with … death squads” is an obscene falsehood. But this base caricature emerges from the day-and-night about-face plot device so successfully implemented in this film. A related storytelling decision that may have been a short-shrift was the decision to tell only the last three years of Romero’s life. Today, even among Romero admirers, people are generally only familiar with his years as archbishop. If you come across Romero quotes, they are almost certainly from his sermons during his three years as archbishop. Although he kept diaries and papers all of his life, only his diaries from his three years as archbishop have been published and translated. Arguably, to understand what made Romero tick, you have to understand who he really was before any conversion. Even if you accept the fact of the conversion, the nature and extent of it will only be understood if you have a sense of what Romero did with the first sixty years of his life, as opposed to just the last three. John Duigan’s 1989 film is still the best movie about “Romero” and still as urgent as it was 25 years ago. “Romero,” La Película, Edición 25 Aniv. Raul Julia y John Duigan. Four Seasons Entmt. (c) 1989. La primera película de Hollywood financiada por la Iglesia Católica estrenó hace veinticinco años, el 25 de agosto de 1989. “Romero” hizo debut con la actuación estelar del puertorriqueño Raúl Julia (“El beso de la mujer araña” y la franquicia de “La Familia Addams”) como el arzobispo salvadoreño Óscar A. Romero, y fue dirigida por el australiano John Duigan. El escritor fue Juan Sacret Heart y el productor fue el P. Ellwood E. Kiesel de Paulist Pictures. “No obstante su origen religioso”, escribió el New York Times, la película fue “francamente un proyecto comercial dirigido a un público de masas”. Pero a diferencia de lo que ocurre en otros sets de películas, el reparto y el equipo de “Romero” se reunían cada semana para oir la misa, con el productor (el P. Kiesel) de celebrante. Lanzada antes de haber transcurrido diez años desde del asesinato de Romero en el año 80, la película fungió esencialmente como el primer borrador de la leyenda Romero, presentando lo que se ha convertido en el paradigma dominante para contar su historia—con todo y su motivo del estudioso conservador que se convierte en un revolucionario después de experimentar un cambio radical tardío, después del asesinato de un amigo cercano. La película ha sido fundamental para llevar a Romero al público, sobre todo en el mundo de habla Inglés. Sin duda, el asesinato de Romero estuvo en los titulares internacionales al final de la Guerra Fría, pero la película presenta un retrato íntimo que resuena mucho más que un titular, y trajo a los espectadores frente a frente con la interpretación del mártir elegante y bien elaborada de Raúl Julia. La película anticipa la institución de la causa de canonización de Romero en 1994, y la inauguración de la estatua de Romero en la fachada oeste de la abadía de Westminster en Londres en 1998. Veinticinco años después, “Romero” ya cobra un lugar legítimo en el cine católico. En 2004, el National Catholic Register y la revista Faith & Family clasificaron a “Romero” en posición no. 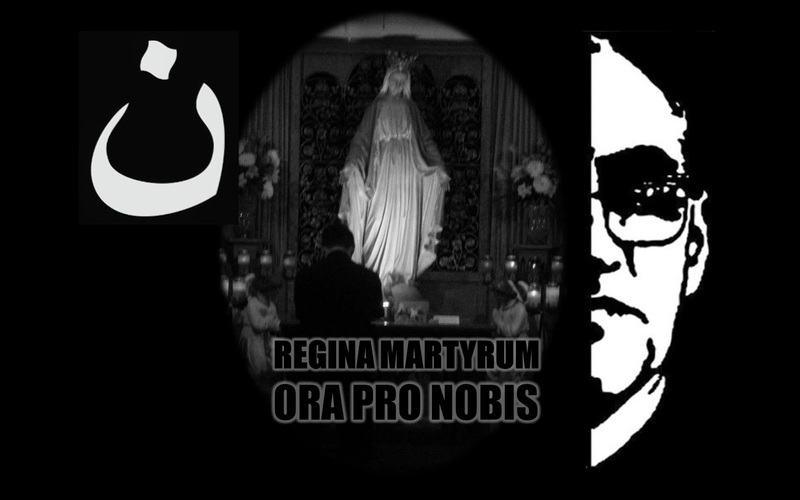 26 en sus “Películas Pro-católicas Top100”, y cuando se puso en marcha la “Quinquenia por la Libertad” de los Obispos Católicos de Estados Unidos en el 2012, el Register recomendó ver a “Romero” durante la QPL. “Romero” aparece habitualmente en las principales listas del cine católico, incluyendo uno publicado a principios de este año. El fallecido Roger Ebert dio alabanzas modestas a “Romero”, escribiendo que “la película tiene un buen corazón, y la actuación de Julia es muy interesante, sobria y considerada”. Sin embargo, Ebert calificó, “la debilidad de la película es una cierta previsibilidad implacable: Podemos presentir en cada momento lo que debe ocurrir en seguida, y la trayectoria generalizada de la película parece ordenada incluso ya en los primeros tiros. Como resultado, la película no mueve muchas pasiones, y parece más bien afligida que enojada”. Aunque Ebert hace criticismos válidos (es por eso que lo citamos), su punto final parece evadir la meta. El verdadero Romero no era enojado, y de esta manera la película pinta un retrato auténtico de su sujeto. Algo que “Romero” no se propuso ser, y nunca debe ser pensado ser, es historia. El film es muy preciso como un boceto de un personaje, como un examen psicológico, y como una radiografía emocional de la historia que cuenta. Pero a la mayoría de los personajes que aparecen en la pantalla se les ha cambiado el nombre, probablemente para evitar demandas por difamación de las personas verdaderas, que aún vivían cuando se hizo la película. Muchos otros personajes son totalmente ficticios o representan compuestos de varias figuras históricas, editados para simplificar la historia o darle prisa. No es deshonesto: la misma práctica se da en otras películas, como “Cristiada” (2012). De la misma forma, hay episodios y eventos que nunca sucedieron (por ejemplo, Romero en la cárcel), pero las dramatizaciones son alegóricas y elucidan la verdad, mientras que otros eventos importantes que sí sucedieron quedaron afuera (por ejemplo, las reuniones de Romero con los papas ). La decisión editorial con mayores consecuencias ha sido sin duda la determinación de retratar a Romero como una conversión de camino-a-Damasco. Cuando abre la película, Romero es un retirado, reservado, y vilipendiado clérigo (“¡Cualquiera menos Romero!” se les escucha a sacerdotes jóvenes quejarse entre sí, en su presencia). Este Romero se demuestra muy cercano a la aristocracia. Al final de la película, Romero se ha hecho un defensor apasionado y valiente de los derechos humanos, querido por las mayorías pobres, y ahora odiado por los oligarcas que eran sus amigos al principio. La película en sí se equilibra en su tratamiento, pero al establecer a Romero en esos contrastes invita al abuso del modelo de la “conversión” de la vida de Romero. Tomemos, por ejemplo, esta descripción de la pre-conversión de Romero: “se puso del lado de los terratenientes codiciosos, los agentes del poder, y los escuadrones de la muerte”. Esto es una grotesca tergiversación—especialmente la parte que Romero estaba “del lado de ... los escuadrones de la muerte” es un la mentira obscena. Pero esta caricatura surge del modelo de conversión repentina implementado con tanto éxito en “Romero”. Otra decisión narrativa relacionada que puede haber trochado el conocimiento de Romero ha sido la decisión de contar sólo los últimos tres años de la vida de Romero. Hoy en día, incluso entre los admiradores de Romero, solo se conocen sus años de arzobispo. Si te encuentras con una cita de Romero, vendrá casi con toda seguridad de sus sermones de sus tres años como arzobispo. A pesar de que mantuvo un diario y otros apuntes por toda su vida, sólo sus diarios de sus tres años como arzobispo han sido publicados y traducidos. Podría decirse que, para entender lo que motivó a Romero, se tiene que entender quién era en realidad antes de cualquier conversión. Incluso si se acepta el hecho de su conversión, la naturaleza y el alcance de la misma sólo se entenderá si se puede adquirir un concepto de lo que Romero hizo con los primeros sesenta años de su vida, y no sólo los últimos tres. Por último, de manera que “Romero” llega a los veinticinco años, es sorprendente lo relevante que sigue siendo para decirle al mundo que la persecución y el martirio son verdaderos, incluso cuando vienen atados a contextos culturales y políticos complejos. Los titulares del día sobre la persecución de los cristianos en Irak y otras regiones en conflicto son suficientes para probar el hecho de que la historia de Romero no es una alusión anacrónica a una época de antaño—los mártires batidos por los torbellinos de la política aún existen hoy en día. Los comentarios del Papa Francisco volando de regreso a Roma después de haber beatificado a 124 mártires en Corea son instructivas. El martirio puede ser una muerte impuesta “por confesar el credo o por hacer las cosas que Jesús nos manda a hacer por el prójimo”, dijo el Papa. “Para mí, Romero es un hombre de Dios”. La película de John Duigan de 1989 sigue siendo la mejor sobre “Romero”, y sigue siendo tan urgente como hace 25 años lo fue. Raul Julia e John Duigan. Four Seasons Entmt. (c) 1989. Il primo film di Hollywood mai essere finanziato dalla Chiesa Cattolica è stato rilasciato 25 anni fa, il 25 agosto, 1989: “Romero” con il portoricano Raul Julia (“Bacio della Spiderwoman” e “La famiglia Addams”) come Mons. 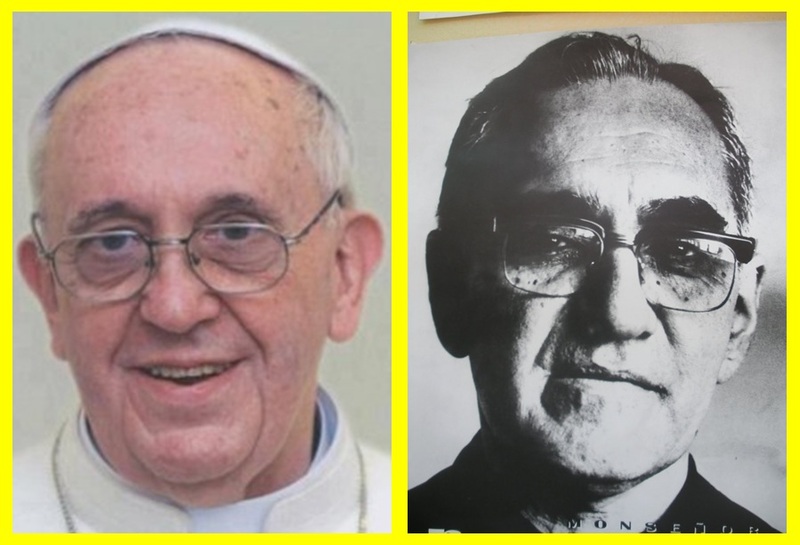 Oscar A. Romero di El Salvador, diretto dalla australiano John Duigan. Lo scrittore era John Sacret Heart (TV “The West Wing”), e il produttore era don Ellwood E. Kiesel di Pictures Paulist. “Nonostante la sua natura religiosa”, il New York Times ha scritto, il film era “una impresa francamente commerciale rivolta a un pubblico di massa”. Ma a differenza di quanto accade in altri set cinematografici, il cast e la troupe di “Romero” si riunivano ogni settimana per celebrare la Messa, con il produttore (P. Kiesel) come celebrante. Rilasciato prima di dieci anni dal l'assassinio di Romero nel 1980, il film è diventato essenzialmente la prima bozza della leggenda Romero, presentando quello che è adesso il paradigma dominante nel raccontare la storia, con il suo motivo di un conservatore libresco che diventa un tizzone dopo aver sperimentato una conversione nell'ultima parte della sua vita, a causa dell'omicidio di un caro amico. Il film è stato determinante nel rendere Romero noto al pubblico, soprattutto nel mondo di lingua inglese. A dire il vero, l'assassinio di Romero ha fatto i titoli internazionali, quando si è verificato alla fine della guerra fredda, ma il film presenta un ritratto intimo che risuona molto più di un titolo lampeggiante, portando gli spettatori faccia a faccia con il ritratto ben congegnato ed elegante di Raul Julia del martire moderno. Il film ha preceduto l'istituzione del proceso di canonizzazione dell'Arcivescovo Romero nel 1994, e l'inaugurazione della statua di Romero sulla facciata ovest della Abbazia di Westminster a Londra nel 1998. Venticinque anni dopo, “Romero” ha avuto il suo giusto posto nel cinema cattolico. Nel 2004, il National Catholic Register e la rivista Faith & Family classificato “Romero” no. 26 nei loro “Top100 Film Pro-cattolici”, e quando i vescovi cattolici degli Stati Uniti hanno lanciato “Due settimane per la libertà” nel 2012, il Register ha raccomandato a guardare “Romero”. Il film è abitualmente elencato nella top list cinematografiche cattoliche, tra cui uno pubblicato all'inizio di quest'anno. Il defunto Roger Ebert ha dato “Romero” modesto lode, scrivendo che “il film ha un buon cuore, e la performance Julia è interessante, sobria e considerata”. Tuttavia, Ebert qualificato, “la debolezza di questo film è una certa prevedibilità implacabile: Possiamo sentire in ogni momento ciò che deve accadere, e la traiettoria sembra ordinata anche nei primi fotogrammi. Di conseguenza, il film non mescolare molte passioni, e sembra più dolente che arrabbiato”. Anche se Ebert fa una critica valida (che è il motivo per cui è citato qui), il suo ultimo punto sembra mancare il bersaglio. Il vero Romero non era arrabbiato, e in questo modo il film dipinge un ritratto autentico del suo soggetto. Una cosa che “Romero” mai ha precisato essere, e non dovrebbe mai essere scambiato per essere, è storia. É molto preciso come uno schizzo del personaggio, come un esame psicologico, e come x-ray emotivo della storia che racconta. Ma la maggior parte dei personaggi sullo schermo, sono stati rinominati, probabilmente per evitare la diffamazione delle persone reali, che erano ancora in vita quando è stato fatto il film. Molti altri personaggi sono del tutto romanzate o, nel migliore dei casi, rappresentano composti di diversi personaggi storici, a cura di semplificare la storia. Non c'è nulla di disonesto in questo: la pratica è lo stesso in altri film. Sulla stessa linea, ci sono sequenze ed eventi che non sono mai accadute (ad esempio, Romero in prigione), ma le drammatizzazioni sono allegorici e suonano vere, mentre altri importanti eventi che hanno si verificano sono stati lasciati fuori (ad esempio, incontri di Romero con i papi). La decisione editoriale più consequenziale ha stato la determinazione di ritrarre Romero, come conversione nella strada al Damasco. Quando si apre il film, Romero è un taciturno, riservato, e vituperato chierico (“Chiunque, ma Romero!” sentiamo dire giovani sacerdoti, in sua presenza). É amichevole con gli aristocratici. Entro la fine del film, Romero è un difensore appassionato e intrepido dei diritti umani, amato dai poveri comune, ed ora insultato da oligarchi che erano i suoi amici all'inizio. Il film stesso è equilibrato nel suo trattamento, ma impostando Romero in tali contrasti, invita l'abuso del modello “conversione” di Romero. Prendete per esempio, questa descrizione di Romero pre-conversione: “si schierò con i proprietari avidi, importanti mediatori di potere, e gli squadroni della morte”. [Scrito di John Dear.] Questo è una falsità grottesca —esoprattutto la parte che Romero “schierato con ... squadroni della morte” è osceno. Ma questa caricatura di base emerge della voltafaccia dal-e-notte giorno implementato con successo in questo film. Un’altra decisione relativa alla narrazione che potrebbe troncare Romero è stata la decisione di raccontare solo gli ultimi tre anni della vita di Romero. Oggi, anche tra ammiratori di Romero, c’e familiarità solo con i suoi anni come arcivescovo. Se avete letto qualche frase parlata da Romero, sono quasi certamente dai suoi sermoni durante i suoi tre anni come arcivescovo. Anche se teneva diari e documenti tutta la sua vita, solo i suoi diari di suoi tre anni come arcivescovo sono stati pubblicati e tradotti. Probabilmente, per capire cosa motivato Romero, devi capire chi era veramente prima di qualsiasi conversione. Anche se si accetta il fatto della conversione, la natura e la portata della conversione sarà compreso solo se si ha un senso di ciò che Romero ha fatto con i primi 60 anni della sua vita, in contrasto con gli ultimi tre. Infine, oggi che “Romero” raggiunge venticinque, è sorprendente quanto sia rilevante rimane in termini di dire al mondo che la persecuzione e il martirio sono reali, anche quando vengono legati in contesti culturali e politiche complesse. I titoli del giorno sulla persecuzione dei cristiani in Iraq e in altre regioni in difficoltà sono sufficienti a dimostrare il punto che la storia di Romero non è un ritorno al passato anacronistico perche i martiri che sono travolti in vortici politici intricati esistono oggi. L’osservazioni di Papa Francesco nel aereo a Roma dopo aver beatificato 124 martiri in Corea sono istruttive. Il martirio potrebbe essere una morte inflitta “sia per aver confessato il Credo, sia per aver fatto le opere che Gesù ci comanda, con il prossimo”, ha detto il papa. “Per me, Romero è un uomo di Dio”. Il film di John Duigan del 1989 è ancora il migliore film su “Romero” e ancora così urgente come lo era 25 anni fa. Saint John Paul II discussed Archbishop Romero in seven different public speeches/audiences. The most famous of these was a 1983 mass in San Salvador where he called Romero a “zealous pastor, whom love of God and service of brethren drove to surrender his life in a violent manner.” Pope Benedict XVI spoke about Romero during three different public events, including an in-flight press conference after a 2007 trip to Brazil, during which he said, “That Romero as a person merits beatification, I have no doubt ... Archbishop Romero was certainly an important witness of the faith, a man of great Christian virtue who worked for peace and against the dictatorship, and was assassinated while celebrating Mass. Consequently, his death was truly 'credible', a witness of faith.” For his part, Pope Francis, while not making public statements before this press conference, had held high profile meetings about Romero, including with two presidents of El Salvador and with a delegation of Salvadoran bishops. Francis' message reads differently based on which part of it people choose to emphasize. The very first report yesterday focused on the Pope saying, "To me, he's a man of God" but we should let the process run its course--which sounded as though Francis wanted to stay hands off. Salvadoran officials seem to be homing in Francis' comment that there are no doctrinal impediments, which suggests that beatification is assured now. That's not really news, as it was reported last year that such an all-clear was given by the Vatican's doctrinal agency under Pope Benedict. The Salvadorans say: well, it's the first time we hear the Pope say it, and that's true--though arguably he's not the most direct source for that information. What I am focusing on the day after is Francis' comment that "the postulators need to move." I think it's a not so subtle message from Francis that he expects the officials handling the matter to expedite it. 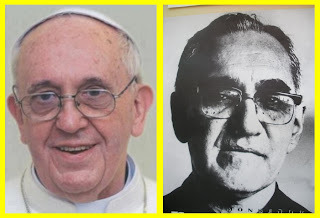 El Papa Francisco ha hablado explícitamente por primera vez acerca de su deseo de ver la beatificación de monseñor Oscar A. Romero de El Salvador, diciendo que, “Para mí, Romero es un hombre de Dios”, e indicando que ya no hay problemas doctrinales que puedan detener el camino a la beatificación del prelado martirizado. “Es importante que el tema avance rápidamente”, agregó el Pontífice. Francisco hizo estas declaraciones a bordo del avión papal que volaba de regreso de su viaje a Corea el lunes 18 de agosto de 2014. El Papa fue interrogado por un periodista sobre el estado de la causa de beatificación y el pontífice respondió que los teólogos todavía tienen que aclarar si Romero fue asesinado a causa de su fe. Francisco llegó a sugerir un camino a los teólogos para resolver lo que ha sido el tema más cerrado del proceso. “Lo que me gustaría es que se aclarara cuando hay un martirio por odio a la fe — por confesar la fe — y cuando por hacer el trabajo por el otro que Jesús manda”, dijo el Pontífice, según informes. Bajo la propuesta de solución de Francisco, la muerte por la causa de la justicia cristiana — a veces llamada «odium iustitiae» — podría establecerse como una fórmula alternativa para probar el martirio en relación a la prueba tradicional (llamada «odium fidei» o “odio a la fe”). Actualmente, es un criterio subordinado, pero el análisis de frecuencia puede enredarse en debates teológicos. Los comentarios de Francisco de hoy representan la primera vez que el Papa ha expresado públicamente su apoyo a la beatificación de Romero. Se dice que ha sido aún más entusiasta en privado, y los comentaristas han observado que el mensaje de Romero parece encajar con los temas del papado de Francisco, especialmente el énfasis en los pobres de un hijo de la Iglesia latinoamericana. Francisco explicó que el proceso había sido “bloqueado por prudencia” por funcionarios del Vaticano, pero debe ser ahora permitido avanzar. El Papa dijo que la investigación debe seguir su curso, y sugirió que el asunto estaba en manos de Dios. “Pero el proceso debe seguir adelante, y Dios tiene que dar su signo. Si quiere hacerlo, lo hará”, dijo el Pontífice. También insinuó que el progreso del proceso depende también de la mano del hombre: “Ahora los postuladores tienen que moverse, ya que no existen impedimentos más”, dijo. El comentario de Francisco que “Romero es un hombre de Dios” debe ser particularmente bien recibido en San Salvador, donde la Iglesia acaba de lanzar un “Trienio Mons. Romero”, un programa de tres años de conmemoraciones que lleva a los 100 años del nacimiento de Romero en 2017. El tema para el primer año es precisamente “Romero, hombre de Dios”. San Juan Pablo II habló de Mons. Romero en siete discursos públicos/audiencias. El más famoso de estas fue una misa en San Salvador en 1983 en que llamó a Romero un “celoso Pastor a quien el amor de Dios y el servicio a los hermanos condujeron hasta la entrega misma de la vida de manera violenta”. El Papa Benedicto XVI habló de Romero durante tres eventos públicos, incluyendo una conferencia de prensa durante el vuelo después de un viaje de 2007 a ​​Brasil, durante la cual, dijo, “De que Romero como una persona amerita la beatificación no tengo ninguna duda ... Ciertamente, monseñor Romero fue un gran testigo de la fe, un hombre de gran virtud cristiana, que se comprometió en favor de la paz y contra la dictadura, y que fue asesinado durante la celebración de la misa. Por tanto, una muerte verdaderamente 'creíble', de testimonio de la fe”. Por su parte, el Papa Francisco, no obstante que no haiga hecho declaraciones públicas antes de esta rueda de prensa, ha celebrado reuniones de alto nivel sobre Romero, incluso con dos presidentes de el Salvador y con una delegación de obispos salvadoreños. P. ¿En qué fase se encuentra el proceso para la causa de monseñor Romero. ¿Qué es lo que le gustaría ver salir de este proceso? R. El proceso estaba en la Congregación para la Doctrina de la Fe, bloqueado "por prudencia", se decía. Ahora está desbloqueado. Ha pasado a la Congregación de los Santos, y sigue el camino normal de un proceso. Depende de cómo se mueven los postuladores. Esto es muy importante hacerlo rápidamente. Lo que me gustaría es haber clarificado cuando hay martirio en 'odium fidei' (por odio a la fe), si es por confesar el credo o por la realización de las obras que Jesús nos manda a hacer por nuestro prójimo. Este es un trabajo de los teólogos que se está estudiando. Porque detrás de él (Romero), está Rutillio Grande y hay otros. Hay otros que también fueron asesinados, pero no están a la misma altura de Romero. Esto tiene que ser distinguido teológicamente. Para mí, Romero es un hombre de Dios. Él era un hombre de Dios, pero hay que hacer el proceso, y también el Señor tendrá que dar su signo (de aprobación). Pero si Él quiere, Él lo hará! Pero ahora los postuladores tienen que moverse porque no hay impedimentos. El mensaje de Francisco se lee diferente según cual parte lleva el énfasis. El primer informe de ayer se centró en las palabras del Papa que: "Para mí, él es un hombre de Dios", pero que debemos dejar que el proceso siga su curso -- lo que sonaba como si Francisco quería lavarse las manos del asunto. Funcionarios salvadoreños parecen estar concentrandose en el comentario de Francisco de que no existen impedimentos doctrinales, lo que sugiere que la beatificación está más o menos asegurada. Eso no es realmente noticia, ya que se había informado el año pasado que el buen ojo había sido dado por la agencia doctrinal del Vaticano durante el papado de Benedicto XVI. Los salvadoreños dirán: bueno, es la primera vez que escuchamos al Papa decirlo, y eso es cierto -- aunque podría decirse que él no es la fuente más directa para esa información. Lo que yo estoy viendo el día después es el comentario de Francisco que "los postuladores necesitan moverse." Creo que es un mensaje no tan sutil de Francisco que él espera que los funcionarios que manejan el asunto lo agilicen. Papa Francesco ha parlato esplicitamente per la prima volta sul suo desiderio di vedere la beatificazione di monsignor Oscar A. Romero di El Salvador, dicendo che, “Per me, Romero è un uomo di Dio” e affermando che ci non sono problemi dottrinali di impedire la beatificazione del prelato martire. “È importante farlo rapidamente”, ha aggiunto il Pontefice. Francesco fece le sue osservazioni a bordo dell'aereo papale al tornare dal suo viaggio in Corea il Lunedi, 18 agosto 2014. Il Papa è stato chiesto da un giornalista sullo stato della causa di beatificazione e il Pontefice ha risposto che i teologi devono ancora chiarire se Romero fosse ucciso a causa della sua fede. Francesco anche suggerito un modo per i teologi per risolvere quello che è stato il problema appiccicoso nel processo. “Quello che vorrei è che si chiariscono quando c'è un martirio per odio alla fede — per confessare la fede — così come per fare il lavoro per l'altro che comanda Gesù,” il Pontefice ha detto secondo si riferesce. Sotto soluzione proposto di Francesco, la morte per la causa della giustizia cristiana — a volte chiamata «odium iustitiae» — dovrebbe essere stabilita come una formula alternativa per dimostrare il martirio in relazione al test tradizionale (chiamato «odium fidei» o “odio alla fede”). Attualmente è una prova subordinata, ma l'analisi può spesso impantanarsi nei dibattiti teologici. Gli osservazioni di Francesco di oggi rappresentano la prima volta che il Papa ha espresso pubblicamente il suo sostegno per la beatificazione di Romero. Si dice sia stato ancor più entusiasta in privato, e commentatori hanno osservato che il messaggio di Romero sembra adattarsi ai temi del pontificato di Francesco, in particolare l'enfasi sui poveri da un figlio della Chiesa latinoamericana. Francesco ha spiegato che il processo era stato “bloccato per prudenza” di funzionari del Vaticano, ma dovrebbe essere ora consentito di avanzare. Il Papa ha detto che l'indagine deve fare il suo corso, e ha suggerito la questione è nelle mani di Dio. “Ma il processo deve andare avanti, e Dio deve dare il suo segno. Se vuole farlo, lo farà”, ha detto il Pontefice. Egli ha anche accennato al fatto che il progresso nel processo dipende anche da mani umane: “adesso i postulatori devono muoversi perché non ci sono impedimenti” ha detto. Il commento di Francesco che “Romero è un uomo di Dio” dovrebbe essere particolarmente ben accolto a San Salvador, dove la Chiesa ha appena lanciato un “Triennio Romero”, un programma di commemorazioni di tre anni che porta al 100 ° anniversario della nascita di Romero nel 2017. Il tema per il primo anno è “Romero, uomo di Dio”. San Giovanni Paolo II ha parlato su Mons. Romero in sette discorsi / udienze pubbliche. Il più famoso di questi era una messa di 1983 a San Salvador, dove ha chiamato Romero un “zelante Pastore che l’amore di Dio e il servizio ai fratelli portarono fino al sacrificio stesso della vita in forma violenta”. Papa Benedetto XVI ha parlato sul Romero durante tre diversi eventi pubblici, tra cui una conferenza stampa in volo dopo un viaggio di 2007 in Brasile, durante la quale ha detto: “Non dubito che la sua persona meriti la beatificazione ... Mons. Romero è stato certamente un grande testimone della fede, un uomo di grande virtù cristiana, che si è impegnato per la pace e contro la dittatura e che è stato ucciso durante la celebrazione della Messa. Quindi una morte veramente 'credibile', di testimonianza della fede”. Da parte sua, il Papa Francesco, pur non facere dichiarazioni pubbliche prima di questo conferenza stampa, aveva tenuto incontri di alto profilo su Romero, anche con due presidenti di El Salvador e con una delegazione di vescovi salvadoregni. D. Lei ha parlato del martirio: a che punto siamo con il processo per il vescovo Romero? Lei cosa vorrebbe vedere uscire da questo processo? R. Il processo era alla Congregazione per la Dottrina della fede, bloccato “per prudenza”, si diceva. Adesso è sbloccato. E’ passato alla Congregazione per i Santi. E segue la strada normale di un processo. Dipende da come si muovono i postulatori. Questo è molto importante, di farlo in fretta. Io, quello che vorrei, è che si chiarisca: quando c’è il martirio in odium fidei, sia per aver confessato il Credo, sia per aver fatto le opere che Gesù ci comanda, con il prossimo. E questo è un lavoro dei teologi, che lo stanno studiando. Perché dietro di lui [Romero], c’è Rutilio Grande e ci sono altri; ci sono altri che sono stati uccisi, ma che non sono alla stessa altezza di Romero. Si deve distinguere teologicamente, questo. Per me Romero è un uomo di Dio, ma si deve fare il processo, e anche il Signore deve dare il suo segno… Se Lui vuole, lo farà. Ma adesso i postulatori devono muoversi perché non ci sono impedimenti. Il messaggio di Francesco 'si legge in modo diverso in base a che parte preferiamo sottolineare. La prima relazione di ieri focalizzata sul Papa dicendo: "Per me, è un uomo di Dio", ma si dovrebbe lasciare che il processo faccia il suo corso - che suonava come se Francesco voleva rimanere di neutralità. Funzionari salvadoregni sembrano di concentrarsi su commento di Francesco 'che non ci siano impedimenti dottrinali, il che suggerisce che la beatificazione è ora assicurata. Questo non è una notizia, perche è stato riferito l'anno scorso che una tale via libera è stato dato dall'agenzia dottrinale del Vaticano sotto il pontificato di Benedetto XVI. I salvadoregni dicono: bene, è la prima volta che sentiamo il Papa dirlo, e questo è vero - anche se probabilmente lui non è la fonte più diretta di tali informazioni. Quello che mi sto concentrando il giorno dopo è il commento di Francesco 'che "i postulatori devono muoversi." Penso che sia un messaggio non così sottile da Francesco, che si aspetta che i funzionari chi gestiscono il caso devono accelerare esso. 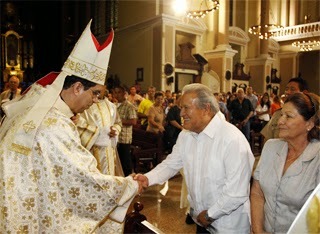 Archbishop Escobar greets President and Mrs. Sanchez Ceren. Prensa Latina photo. Archbishop Oscar A. Romero’s 97th birthday was marked with the launching in San Salvador of a three-year commemorative program leading up to his 2017 centennial; with expanded tributes online; and with continued behind-the-scenes work on his beatification cause in Rome. Flying back from a trip to South Korea, Pope Francis told reporters, “For me, Romero is a man of God,” but said the beatification process must be allowed to run its course. The first year of the commemorations, which runs from August 2014 through July 2015 honors Romero, Man of God, and includes monthly meditations based on Romero’s spirituality. Super Martyrio commits to follow the program and post monthly reflections that track the official program. From August 2015-July 2016, the Triennium will pay tribute to Romero, Man of the Church and the last year culminating in the 100th anniversary of Romero’s 1917 birth will memorialize Romero, Servant of the Poor. It is hoped that Pope Francis will participate in the centenary celebrations. New statue unveiled in Ciudad Barrios. Museo Romero photo. 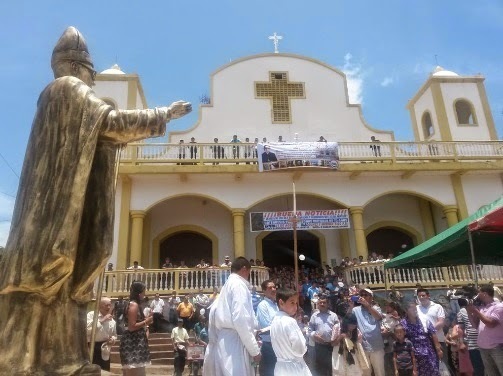 In Ciudad Barrios, the remote village in El Salvador where Romero was born, a new statue of the favorite son was unveiled. The square outside the village church, where Romero volunteered to sweep the floors as a child, has been renamed Oscar Romero Park. Late night fireworks lit up the hillside hamlet’s sky to cap off the festivities. Around the world, many remembered Romero on the Internet. No one worked harder to promote Romero this year than the members of the Christian rock group The Project, whose musical video “Romero” has become a staple for commemorating the Salvadoran martyr. “This year, in promoting the video we concentrated our efforts on El Salvador making use of social media - mainly Twitter and Facebook,” the group’s Duane Arnold told Super Martyrio. In addition to generating thousands of hits on YouTube, the group got play on more than a dozen radio stations and a number of television stations in El Salvador, and posted to several government-affiliated web sites and feeds. Although their album features powerful testimonies of other martyrs, “we do feel a special devotion to Romero,” said the group’s Arnold. “He is a modern man - a modern saint. He allowed himself to be moved by the events of his time, as we must.” Other online tributes to Romero this year included a remembrance on Patheos and a new collection of quotes from the Ignatian Solidarity Network. Meanwhile, Vatican officials continued to quietly complete work on the martyred bishop’s beatification cause. Flying back from his trip to South Korea, Pope Francis said that theologians still need to clarify whether martyrdom applies only to those killed for professing the faith or also to those killed for doing the “works that Jesus commands us to do for our neighbor,” according to CNS. “For me, Romero is a man of God,” Francis was quoted as saying. “But the process must go ahead, and God must give his sign. If he wants to do so, he will.” Archbishop Vincenzo Paglia, the Postulator of the Cause, broke from his usual reserve to congratulate The Project. “I thank God for you,” Paglia Tweeted the group. On Friday, August 15, 2014, the St. Egidio Community of Rome will lead a prayer service at the Basilica of St. Bartholomew on Tiber Island—a shrine to the Church’s modern martyrs—to show solidarity with the persecuted Christians of Iraq and the Middle East. That same day will mark the 97th anniversary of the birth of the martyred Archbishop Oscar A. Romero of El Salvador, whose prayer book is kept as a relic at the church. This year, Romero’s birthday comes amid a renewed climate of Christian persecution and its commemoration provides a solemn occasion for solidarity, prayer, and prophetic denunciation of those unjust situations. First, the life and example of Oscar Romero becomes a vivid point of reference, which shows that persecution and martyrdom continue to be relevant for the Church. Before he became himself a victim of church persecution, Romero was a valiant voice of denunciation of the policies of repression that targeted his Church. “Persecution is a reality that is necessary for the Church,” he declared. “You know why? Because the truth is persecuted. Jesus told his disciples: if they persecuted me, they will also persecute you (John 15:20).” (May 29, 1977 Hom.) He recalled Pope Leo XIII’s corollary to the well-known “Four Marks of the Church”— One, Holy, Catholic, and Apostolic—“I would add another: persecuted.” (Ibid.) “A Church that does not suffer persecution is not the true church of Jesus Christ,” Romero declared (Mar. 11, 1979 Hom.) “Thanks to God,” Romero said, “we are not only aware of the stories of the martyrs of past ages but we are also conscious of the martyrs of our own time.” (Apr. 14, 1979 Hom.) For example, “Cardinal Woytila reminds us of the times of the catacombs and the times of the [Roman] circus,” Romero said: “the times of the martyrs.” (Oct. 29, 1978 Hom.) And Romero always joined in solidarity when the Popes of his time called for prayers for the conflict in the Holy Land and the region. Second, we are living a moment that calls for prayer and solidarity. On Friday, August 15, the Italian Church is holding its Day of Prayer for persecuted Christians. On Saturday the 16th, Pope Francis will beatify 124 martyrs in Korea, an occasion which will surely remind the world of the urgent situation for Christians in the Middle East and in other conflict areas. Sunday the 17th is the day the U.S. bishops have called for prayers for the “Nazari” persecutions (of Christians) in Iraq. Filipino Catholics have been urged to set aside Aug. 18, Monday, as a day of prayer for peace in Iraq. In sum, if the theme of the times proves the relevancy of Archbishop Romero, we can also say that the memory of Romero must be considered in a key of solidarity and prayer, which helps the reflection recover the fullness of its meaning and importance. Have a blessed Feast of the Assumption, which marks the 97th anniversary of the birth of Oscar Romero. Let us ask for his intercession on behalf of our Christian brothers and sisters who suffer persecution today.